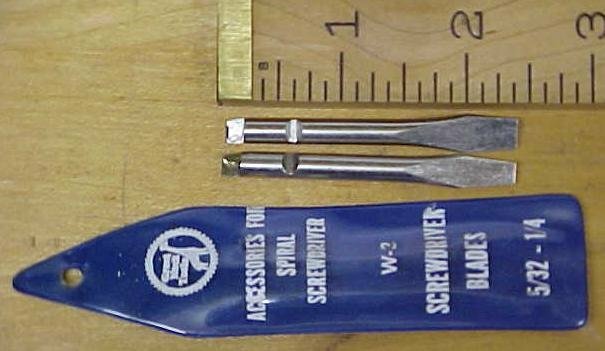 This is a new old stock .2185 / 7/32" diameter, set of (2) bits, with (1) 5/32", and (1) 1/4" slot screwdriver tip, for Yankee style (smallest) screwdrivers, like a No. 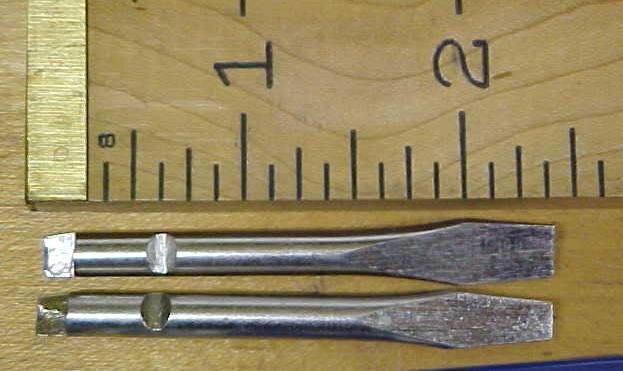 133H, 135, & 233H model Yankee, may fit other brand names as well that accept the Yankee style tooling with the notch and flat on the shank. We have tested these to be sure that they do fit the models mentioned above. The screwdriver tip is 2.37" long overall, and has a flash chrome type finish. The pouch or envolope type pack is marked "GREAT NECK TOOLS ACCESSORIES FOR SPIRAL SCREWDRIVER W-3 SCREWDRIVER BLADES 5/32-1/4" on the clear soft plastic side. Hard to find! We have many North Brothers and Stanley Yankee tools and parts in stock. Let us know if we can help you find what your need. Items Similar To "Yankee No. 133 / 233H/135 Slot Bit Screwdriver Tip Set"